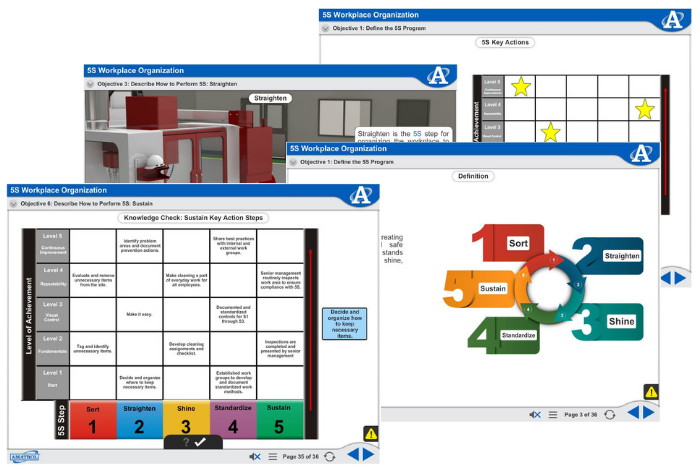 Amatrol’s Lean Manufacturing 5S Multimedia Courseware (MXLM102) covers workplace organization and the steps of 5S: Sort, Straighten, Shine, Standardize, and Sustain. Within this lean manufacturing online training course, learners will study the key action steps within each 5S area to implement Lean Manufacturing processes, such as item organization, marking storage locations, outline locations, and shadow boards. In this module, learners using Amatrol’s 5S workplace organization eLearning course will study basic principles of workplace organization, including defining a 5S program, as well as how to perform the 5S’s: sort, straighten, shine, standardize, and sustain. Amatrol’s Workplace Organization eLearning course curriculum features a highly-interactive multimedia format. Stunning 3D animations, videos, pictures, voiceovers of all text, and interactive quizzes and exercises bring learning to life. Amatrol’s multimedia curriculum contains elements that will appeal to every learning style, keeping learners motivated and engaged.